The FM36 Blue Filter produces a smooth beam of blue light. Hunters use the blue filter to track wounded game at night because blood stands out more distinctly against foliage when viewed under blue light. 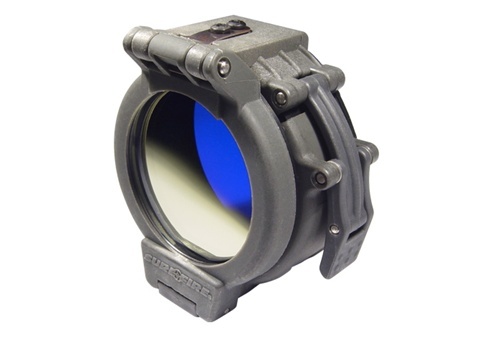 The filter is also useful for close range, non-tactical applications - such as map reading -- as it reduces the intensity of light output. Applying thumb pressure to the locking tab releases the cover; a spring mechanism keeps the open cover out of the way by holding it flat against the flashlight. A cam-locking lever keeps the entire unit securely attached to the flashlight.